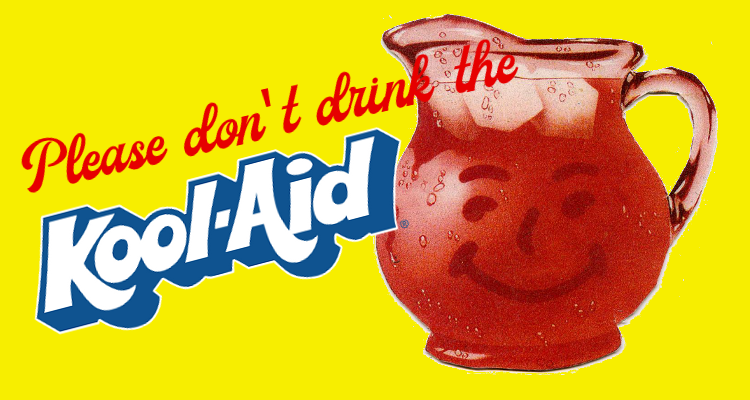 Please don’t drink the Kool-Aid! There’s a $500 million pitcher of Kool-Aid making the rounds and numerous people including many in media have been consuming it in unhealthy quantities to the detriment of credibility. Recently Co-Lead Class Counsel for the NFL Concussion Settlement, Chris Seeger, mixed up an especially sugary batch through a widely distributed press release which links to the following video. I’m truly astounded by how many outlets who should have known better than to start pouring and passing out glasses of a potentially tainted brew without doing a quality check, did so without hesitation. The photo below represents only a small fraction of those who took the bait. The Associated Press appears to have been the first to publish with a re-hash that amounts to a paraphrase of the press release. Numerous other outlets, large and small quickly clamored on their heels to be the next to report. The timing of the press release immediately followed status reports from Seeger and Claims Administrator BrownGreer which also proclaim the success of the settlement. Additional emphasis is placed on over 7,000 baseline assessment (BAP) appointments scheduled and more than 6,000 attended without revealing that some players have waited more than 6 months for their test results and publishing no figures to indicate how many exams have resulted in a qualifying diagnosis. Instead, Seeger emphasized that his firm would continue to push “to get more legitimate claims paid,” and that he would continue to fight until every player deserving compensation was paid. It’s an unfortunate reality that wherever there is money to be obtained, there will be some who attempt to wrongfully avail themselves of a share, but many of the claims presented as fraudulent, or lacking a qualifying diagnosis seem to be the result of extensive efforts to disqualify players through use of unreliable circumstantial social media evidence and questionable standards of evaluation. I’ll develop this assertion a bit later, but for now, let’s take a look at information readily available to media that requires minimal effort to produce. 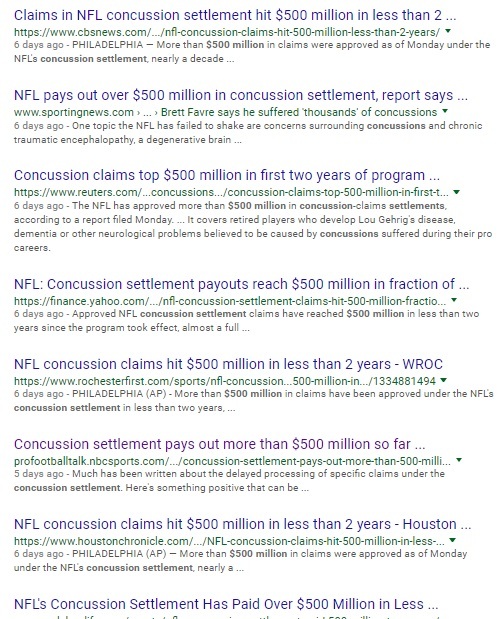 In the PR release, Mr. Seeger included a link to the concussion settlement website, which updates claims reports weekly. From the link only two clicks are needed to access the current report, as shown on the left. The report provides a much more comprehensive but less optimistic view of the settlement to date. If a low-level blogger is able to figure this out, why can’t a news organization staffed with professionals? To their credit, several major outlets including the New York Times, Washington Post, and Boston Globe didn’t blink, but with networks like ESPN, CBS, NBC and Fox Sports distributing the Kool-Aid it seems appropriate to ask why so many generally competent organizations, would do such sloppy work. Could it be that football season is getting underway and they don’t want to risk the ire of the NFL? Perhaps they are seeking to keep advertisers happy and plugging into their game broadcasts? This narrative is further supported by a conversation I had with the wife a retired NFL player who suffers from Parkinson’s disease. When his NFL disability claim was denied, she said she called up some beat writers who had been friendly with them during her husband’s playing career and asked if they’d bring attention to what was taking place. Everyone she called gave her the same line, “I’m really sympathetic to what you’re experiencing, but I can’t help you. If I did, the NFL would yank my credentials.” The press release and subsequent coverage by media, portrays the United States’ most profitable and powerful sports entity as compassionately caring for its players, likely making for good relations to kick off the 2018 season despite ample and easily accessed evidence to the contrary. How off base was the reporting? Click the link to the press release then Google some of the articles to compare. Then continue reading and decide for yourself. While Mr. Seeger correctly stated that over $500 million has “already been approved,” he failed to point out the discrepancy between approved and paid claims, the latter amount totaling $281,347,365, or about 55% of the “approvals.” Despite Mr. Seeger’s correct terminology, and the ease of verifying this very basic information numerous outlets erroneously reported the approval amount as having already been paid. Aside from being a huge PR win for the NFL and Seeger, the spin has created confusion and anger among the class of retired players. A scenario I’d have never imagined occurred as a result. A frustrated player called his attorney demanding to know why “everyone else was getting paid and he wasn’t.” Unable to convince the player that the $500 million was grossly misleading, in exasperation, he called asking me to “please explain the reality of the settlement” to his client. I pulled up the most recent summary report, dated July 30, reading and explaining the figures, the first of which was the discrepancy between approved and paid claims. Just because a claim has been approved, it doesn’t mean that the money is guaranteed to move to the “paid” column; only that it has cleared its first significant hurdle. The NFL has thirty days after approval to file an appeal or request an audit. An audit is particularly troubling in that there is no established deadline for removal. Many of the approved claims had already been subjected to an audit prior to approval and another NFL request resets the clock buying time for the NFL to dig for information to discredit the claim. Of the 541 notices of approval which comprise the $500 million figure, 380 of those approvals have resulted in actual compensation to retired players. There are currently 162 claims in audit, a combination of claims yet to be approved and audits of approved claims. Of the 141 approved claims that have not yet been paid, 38 have been appealed and 50 claims appear to be slated for payment in August. Seeger’s press release boasted that in under two years, claim approvals had exceeded ten-year projections. The reason for this is simple. Actuaries commissioned by both the NFL and Co-Lead Class Counsel were designed to support a proposed $765 million settlement. The experts who prepared the actuaries were in all likelihood instructed to construct data to support that figure. Attorneys representing players have told me that if everyone who deserved to be approved was, the payouts could exceed $4 billion. In preparing his July 18 status report, Seeger called on Thomas Vasquez of Ankura Consulting Group, who prepared the original low-ball actuary. Mr. Vasquez now accounts for the discrepancy in stating that participation in the settlement is 21 percentage points higher than he’d anticipated and based on that he raised his projected value of the settlement to $1.4 billion over the 65-year term. 41 ALS claims have been filed in under 2 years. 29 have been paid, 10 under review, only 2 denied. Aside from the fact that the horrific disease of ALS is much more prevalent in the retired NFL population that anyone wanted to admit, compensation for ALS claims which are for the most part irrefutable account for $73,849,365 or 26% of the $281,347,365 that has actually reached the players while accounting for 1% of the 1,942 claims submitted as of July 30. While it’s appropriate to expedite claims of players enduring the ravages of ALS, even they didn’t find the claims process quick and easy as was the pitch from Mr. Seeger during the enrollment period when he indicated that a player with a current diagnosis could submit a claim and expect payment within weeks. Players living with other impairments deserve compensation too. The first year of the settlement saw virtually no dementia claims approved despite being by far the most prevalent diagnosis. In April the numbers began to increase, and I believe this is in large part due to a motion filed by Locks Law Firm in late March. In the motion, Locks stated that the settlement was “in danger of failing its execution,” and provided between the motion and exhibits 82 pages of evidence to support his assertion, much of which I covered in an article written shortly after it was filed. In a follow-up article, that broke down Seeger’s response, I noted a one-week spike in dementia claims approvals which nearly doubled the number of all dementia claims approved during the first year. I opined that the sudden increase appeared to be a reaction to the Locks motion and an attempt to discredit it. I suspected approvals would continue to rise, since major media was now reporting on the obstacles players with dementia were facing. My hunch appears to be correct. Approvals for Levels 2.0 and 1.5 Neurocognitive Impairment (dementia) have continued to increase since I first connected the dots. Despite the increases, however, the numbers are still dismal. 1,250 of 1,942 or about 64% of claims filed have been for dementia diagnoses. Of these 186, or 15% have been approved with only 60, or just under 5% reported as paid. Even more troubling than the low numbers, is the reasoning behind the denials, audits, and slow approvals. Advocacy for Fairness in Sports has obtained substantial documentation on some of the claims the NFL has appealed, including initial award notices, medical records, and NFL appeal briefs which include the arguments the league’s lawyers are using to support their assertion that the claim should be denied. One prevalent tactic is using a record of mental illness and/or substance abuse to deny that the player’s impairment was caused by football. A handful of doctors, and generally physicians with a direct or indirect working relationship with the NFL have written papers attributing neurological defects experienced by players to substance abuse and mental health issues rather than the pounding their heads received while playing the game. One doctor was Grant Iverson, a CTE skeptic who curiously was used by Seeger-Weiss as an expert for the plaintiffs and instrumental in development of the settlement’s stringent baseline assessment program. The NFL is now using Iverson’s dubious research to blame players’ deficiencies on mental health or substance abuse, completely ignoring the fact that many of those who are dealing with these problems became addicted because of the massive drugs administered to them during their NFL careers, and entered the league with no mental health issues. Irregardless, football causation was supposedly not an element that had to be demonstrated in order for the NFL avoid admitting liability, but the tactic is being employed nonetheless. Some of the documents I’ve reviewed are also consistent with the NFL’s arguments urging a special fraud investigator at the May 30 hearing. Neurocognitive (CDR) testing examines six areas of functionality, as noted in this description from the Massachusetts Alzheimer’s Disease Research Center website. 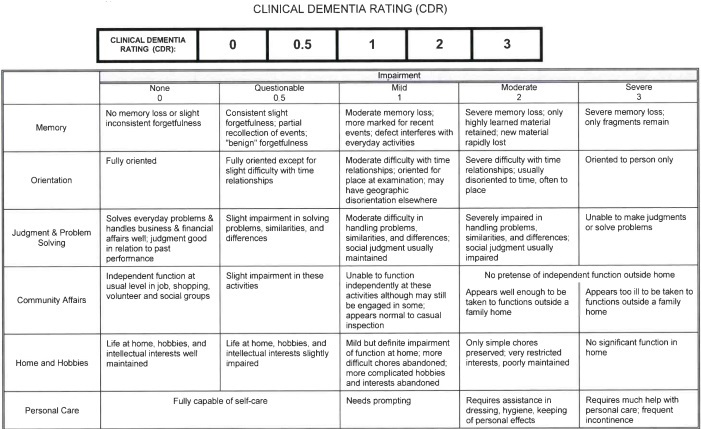 The NFL seems to be primarily concerned with only three areas – Community Affairs, Home & Hobbies, and Personal Care, although medical standards evaluate each of the six domains to determine if a person has dementia and if so, how advanced by looking at the domains individually and then considering their combined impact on the patient. The NFL’s focus on these specific areas, which are outside the memory and orientation domains in which most players report difficulty seem to be the easiest and most direct route to discrediting a diagnosis. The NFL attempts to ignore substantial impairment in other areas that either severely reduce or eliminate a retired player’s ability to work and function. The chart below, assuming that a player must score “2” or “3” in the NFL’s target areas shows why the claims of many legitimately ill retirees are rejected. Without considering other factors, and basing legitimacy on only three domains, the NFL demands that a player should demonstrate no pretense of independent function outside the home, have only very restricted and poorly maintained interests, and require assistance in dressing and hygiene. To the NFL it seems irrelevant that a player has severe memory loss and is unable to retain new material, is disoriented, and lacks the ability to handle problems or exercise social judgment. Instead, they scour the internet to find photos to demonstrate that a player has been seen in the public socially and appears to be capable of dressing himself. Employment records are also scoured, with any employment over the past several years, or business ownership also used to discredit the player. In the examples I’ve been able to review, employment was short-lived because the player was unable to do the job. Incorporation of a business has mostly been for show and doesn’t really constitute work or provide an income. In some instances the wife is doing all of the work while allowing her husband the dignity of presenting himself as a business owner. Other “businesses” were actually the result of impaired players falling for scams. Sometimes players listed volunteer positions as jobs on social media in order to appear or feel productive and had this held against them whether or not they were doing much more than merely showing up. The NFL continues to deny the true and progressive nature of neurodegenerative disease. Neurocognitive impairment is not like breaking a bone – one minute you’re fine, the next minute you’re not. Cognitive functions deteriorate over a period of time, and the length of time can vary from person to person. Because of this, recent employment, whether it’s for the most part a façade, or the final efforts of a man slowly losing his battle to earn an income should not be sufficient reason to deny a claim when medical documentation, often including a sworn physician’s statement attesting to the diagnosis is presented. Instead of acting in a manner of decency and treating these men with compassion for the damage exacted by their football careers, they seek to deny them any dignity at all, and endeavor to avoid compensation until the player is a virtual zombie who at that point probably won’t even be able to comprehend that his award was finally issued. The longer the NFL can delay and the older a player is when a diagnosis is accepted, the less money the league is obligated to pay out. Chris Seeger is fond of stating that achieving a settlement with the NFL was a monumental achievement. That much is true. Whether the settlement remains a monumental achievement or devolves into a monumental disaster is dependent on recognizing and accepting the legitimacy of the illnesses players are suffering and compensating them as promised. That’s a problem that won’t be fixed by mixing up a pitcher of Kool-Aid. If Seeger wants to claim success, then he needs to realize that the real work is just beginning and if Judge Brody wishes to view the settlement as the crowning achievement of her legacy, she must avoid the Kool-Aid and focus on the purpose of the settlement and correcting the problems that threaten to derail it.